The What: Clear-Com has launched a Dante interface card for the Eclipse-HX matrix (E-Dante64-HX). The card, which is compatible with Eclipse HX-Omega, Median, and Delta matrix systems, supports Dante and is AES67 compatible, allowing users to transport up to 64 channels of high-quality audio to multiple Dante-enabled devices using standard Ethernet network infrastructure. 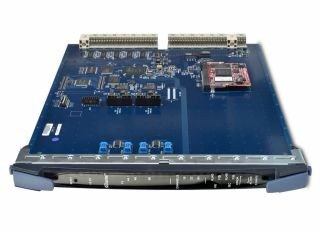 The What Else: The E-Dante64-HX Interface Card provides Eclipse HX with 16, 32, or 64 channels of low-latency, high-quality AoIP interconnection. It supports all standard sample frequencies for professional use, including a 96kHz/32-channel option. Other features include channel quantity, health, and sample rate indicators; primary and secondary RJ-45 or fiber connections; port label data exchange to intercom panel keys; up to 64 ports per card; maximum of 7 cards per frame; and supports third-party AES67 interfaces. The card delivers high audio quality interfacing for Eclipse-HX, and may be used to route IFB feeds to/from a mixing console to provide instruction to on-air talent. If necessary, the card can be readily used in the broadcast chain offering a high quality and low latency transport. The Bottom Line: The E-Dante64-card brings benefits to various live performance settings where Dante devices are widely used. Whether at a corporate event, concert tour, or house of worship, the A1 or A2 on Clear-Com’s FreeSpeak II wireless intercom beltpack can monitor or check any performer’s audio directly from the beltpack using the scroll assignment feature, eliminating the need for another audio engineer to perform this check. Once the audio performance is confirmed, then he/she can immediately inform all parties over the intercom.